Can’t attend Dell World 2011? Go virtually! Update 10/3: Dell World 2011 in Austin is now sold out. Join us virtually! It’s free, and you can register now at Dell World: Live Online. Are you an IT professional who can't make it to Austin for Dell World 2011? No worries – stream it! Dell World: Live Online lets you experience all the fantastic social media, data center, cloud and mobile innovation discussions going on at the Austin Convention Center. Watch the keynotes live. Stream interviews with speakers and attendees from the Dell World news desk. Participate in exclusive webinars hosted by Dell enterprise technology experts. 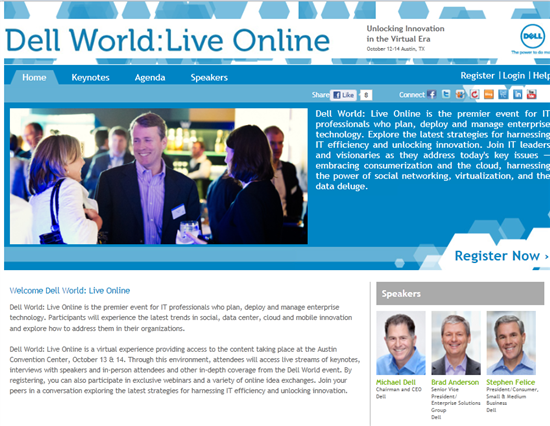 Chat with other virtual attendees in the online versions of Dell World’s Idea Exchange sessions. Dell World: Live Online gives you access to the latest strategies for harnessing IT efficiency and unlocking innovation. Unfortunately, we haven’t figured out how to stream Austin’s amazing BBQ over the Web… we’re working on that. If we won’t see you in Austin, we look forward to seeing you at Dell World: Live Online. For media and analysts, check out our virtual press kit which includes all press releases, blog post, contact details and other resources you'll need for the event. And don't forget to follow the conversations on Twitter with the #DellWorld hashtag.